Just like signing days for athletes, the second-annual Washington STEM Signing Day presented in partnership with Boeing celebrated high school seniors from across the state as they made their commitments to some of the state and country’s top technical schools, colleges, and universities. 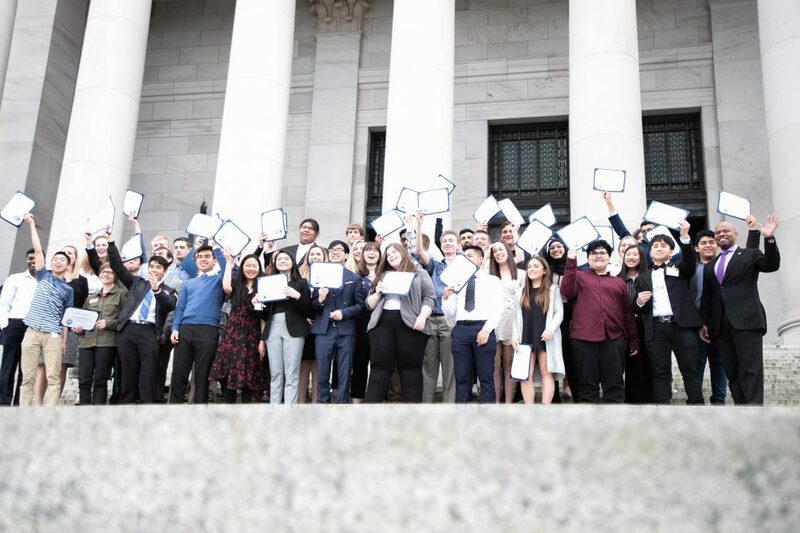 Students signed STEM Letters of Intent at the state capitol in Olympia during a ceremony attended by family members, elected officials and leadership from Boeing. Forty-nine students, one from each legislative district across the state, were selected to take part in the event based on their involvement in STEM education in school and community. These students will be bringing their talents in pursuit of careers in STEM fields and putting themselves on the fast track for success. A complete list of honorees follows. Julia Isabella Gaynor is a senior at Aberdeen High School. Julia plans to study organismal biology at Montana State University. Julia represents LD 19. Kai Kawashima is a senior at Aberdeen High School. Kai plans to study computer science or game design at DigiPen Institute of Technology. Kai represents LD 24. Taylor Harpe is a senior at Battle Ground High School. Taylor plans to study aeronautical engineering at Embry-Riddle Aeronautical University, Prescott. Taylor represents LD 18. Sadie Hollingsworth is a senior at Arlington High School. Sadie plans to study aerospace engineering at the University of Washington. Sadie represents LD 10. Michael Kopcho is a senior at Auburn-Riverside High School. Michael plans to study computer science at Oregon State University. Michael represents LD 31. Eshika Saxena is a senior at Interlake High School. Eshika plans to study engineering at Massachusetts Institute of Technology (MIT). Eshika represents LD 48. Kent Richard Zeng is a senior at Newport High School. Kent plans to study engineering at University of Washington. Kent represents LD 41. David Blaze White is a senior at Squalicum High School. David plans to study mechanical engineering at the University of Washington. David represents LD 40. Alexandra Hao is a senior at Blaine High School. Alexandra plans to study biochemistry or chemistry at University of Washington. Alexandra represents LD 42. Precious Jane Stowers is a senior at Bremerton High School. Precious plans to study computer science at the University of Washington. Precious represents LD 23. Joshua Aguirre is a senior at Bremerton High School. Joshua plans to study health sciences or nursing at Olympic College. Joshua represents LD 26. Jeremy Sabado Tirador is a senior at Bremerton High School. Jeremy plans to study computer science at University of Washington – Tacoma. Jeremy represents LD 35. Brayden Brown is a senior at Wenatchee High School. Brayden plans to study computer science at Oregon State University – Cascades. Brayden represents LD 12. Alkasem Alzmar is a senior at Everett High School. Alkasem plans to study mechatronics at Everett Community College. Alkasem represents LD 38. Grace Atkinson is a senior at Mountlake Terrace High School. Grace plans to study behavioral sciences at Western Washington University. Grace represents LD 44. Joeseph Cummings is a senior at Decatur High School. Joeseph plans to study aviation maintenance technology at South Seattle Community College. Joeseph represents LD 30. Irving Ozuna is a senior at Delta High School. Irving plans to study architecture at Washington State University. Irving represents LD 9. Kevin E. Fabila-Alvarez is a senior at Kentridge High School. Kevin plans to study neuroscience at Washington State University. Kevin represents LD 33. Maleeha Nizar is a senior at Kent-Meridian High School. Maleeha plans to study medical sciences at University of Washington – Tacoma. Maleeha represents LD 47. Kaitlyn Pegram is a senior at Central Valley High School. Kaitlyn plans to study engineering at Washington State University. Kaitlyn represents LD 4. Vanesa Jaden Estrada is a senior at Mountlake Terrace High School. Vanesa plans to study biology or biological sciences at Western Washington University. Vanesa represents LD 21. Teresa Bonilla is a senior at Mountlake Terrace High School. Teresa plans to study neuroscience at University of Washington. Teresa represents LD 32. Hitesh Boinpally is a senior at Tahoma High School. Hitesh plans to study computer science at University of Washington. Hitesh represents LD 5. Nathaniel Boutain is a senior at Mount Spokane High School. Nathaniel plans to study mechanical engineering or automotive engineering at Spokane Falls Community College or Eastern Washington University. Nathaniel represents LD 7. Dawson Brindle is a senior at W.F West High School. Dawson plans to study aerospace engineering at Embry-Riddle Aeronautical University, Prescott. Dawson represents LD 20. Phong Bach is a senior at Mountlake Terrace High school. Phong plans to study biology at the University of Washington. Phong represents LD 1. Rodolfo (Rudy) Garcia III is a senior at Delta High School. Rudy plans to study mechanical engineering at University of Washington. Rudy represents LD 9. Ashley Ripplinger is a senior at Prosser Senior High School. Ashley plans to study renewable energy engineering at Oregon institute of Technology. Ashley represents LD 16. Jayr Gudino is a senior at Quincy High School. Jayr plans to study computer science at Washington State University. Jayr represents LD 13. Markus Hindman is a senior at TESLA STEM High School. Markus plans to study engineering at Western Washington University. Markus represents LD 45. Mariah Melena is a senior at Challenger High School. Mariah plans to study computer science and forensics at Clover Park Technical College. Mariah represents LD 2. Carlos Cura is a senior at Cleveland STEM High School. Carlos plans to study chemical engineering at University of Washington. Carlos represents LD 11. Grant Matthews is a senior at Raisbeck Aviation High School. Grant plans to study aerospace engineering at Purdue University or Embry Riddle Aeronautical University. Grant represents LD 34. Michaela Fennell is a senior at Holy Names Academy. Michaela plans to study mechanical engineering at Purdue University. Michaela represents LD 36. Ethan Brown is a senior at Cleveland STEM High School. Ethan plans to study biology at Western Washington University. Ethan represents LD 37. Jackson Miller is a senior at Roosevelt High School. Jackson plans to study aeronautics and pilotage at Central Washington University. Jackson represents LD 43. Nick Tran is a senior at Raisbeck Aviation High School. Nick plans to study aerospace engineering at University of Michigan. Nick represents LD 46. Katherine (Katie) Anderson is a senior at Snohomish High School. Katie plans to study biochemistry at University of Hawaii Hilo or Eastern Oregon University. Katie represents LD 39. Alex Birkeland is a senior at Bethel High School. Alex plans to study civil, mechanical, or industrial engineering at Central Washington University. Alex represents LD 29. Jaidan Suber is a senior at Shadle Park High School. Jaidan plans to study marine biology at Western Washington University. Jaidan represents LD 3. Rachel Harwood is a senior at North Central High School. Rachel plans to study biochemistry at University of Washington. Rachel represents LD 6. Khai Nguyen is a senior at Pierce County Skill Center. Khai plans to study information technology at Clover Park Technical College. Khai represents LD 25. Sam Yost is a senior at Stadium High School. Sam plans to study computer engineering at Boise State University. Sam represents LD 27. Aylish Turner is a senior at Steilacoom High School who attends the Pierce County Skills Center. Aylish plans to study Interactive Media at University of Southern California. Aylish represents LD 28. Christopher Gizinski is a senior at Tumwater High School. Christopher plans to study medical sciences at post-secondary institution he has yet to decide on. Christopher represents LD 22. Grace Fulfer is a senior at Skyview High School. Grace plans to study mechanical engineering or Spanish at Baylor University or Western Washington University. Grace represents LD 17. Yaneri Garcia-Hernandez is a senior at Vancouver iTech Preparatory. Yanerie plans to study neuroscience at Washington State University – Vancouver. Yanerie represents LD 49. Zachariah Coscarart is a senior at Eisenhower High School. Zachariah plans to study computer science at Washington State University. Zachariah represents LD 14. Carter Martinez is a senior at Eisenhower High School. Carter plans to study biochemistry at the University of Washington. Carter represents LD 15.